2 Bed apartment within 5 minutes walk to one of the best beaches in the UK. 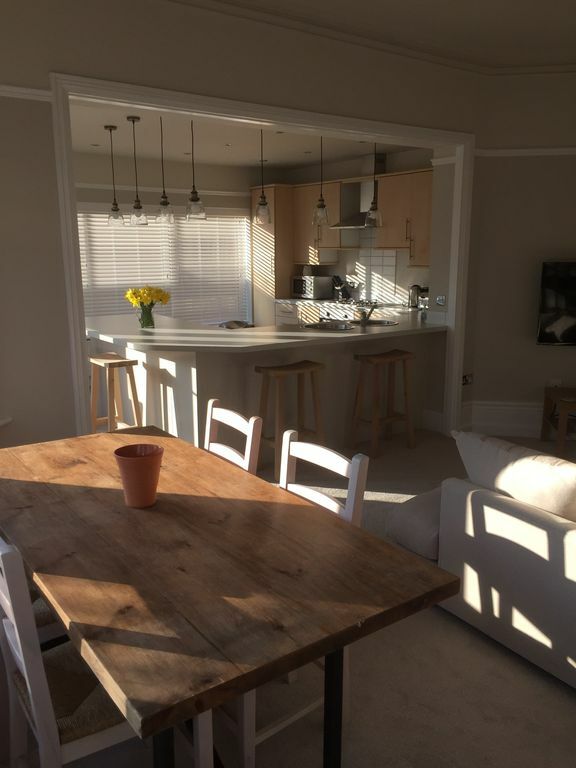 Newly refurbished (April 2017) Beach Holiday Apartment, only a few minutes walk to the stunning Alum Chine beach which has once again been awarded the prestigious Blue Flag award for its world class pristine golden sands, excellent water quality and safe bathing. The Anchorage has two double bedrooms, one with a King size bed and the other with two single beds that can be joined to form a king size bed if requested, in the lounge is a large L shaped sofa that sleeps two people comfortably . The Apartment offers all the modern conveniences and, as it has all been recently replaced, everything is in perfect order. From the balcony as well as being able to see the sea, there are also amazing views over the tree tops of the famous chine. It is ideally situated, making it the perfect base to explore the area by car or bike, such as the world famous Jurassic coast and the beaches and heathlands of Studland bay, only a short ferry ride away. For the more active holiday makers, water sports and golf facilities are within easy reach. For the families with young children Alum Chine has a wonderful play area right next to the lovely beach. The apartment lies within a twenty minute walk along the promenade to Bournemouth pier or 5 minutes if you catch the noddy train to all the attractions of Bournemouth town centre including fabulous shopping, restaurants and bars. A ten minute stroll up the tree lined chine takes you to Westbourne village again offering quaint shops, good restaurants and bars as well as a Marks and Spencer food hall, a Tesco express, a butchers and bakers etc. Heading West along the promenade will take you to the stunning Sandbanks beach with all its water sports and recently opened Rick Stein's latest restaurant amongst others. Cycling along the promenade is permitted all year round except in the summer months July 1st to 30th September it is restricted to before 9am and after 6pm the perfect way to explore Studland. We have excellent transport links: 20 minutes from Hurn airport, frequent train links to and from London Waterloo (1.3 miles to Branksome station, 1.9 miles to Bournemouth station), National express from Victoria to Bournemouth train station every day and of course good road links with the M3, M27 down to the south coast. The apartment is one of six in the block. There are people above and below so you will have a sense of people around you. It is an old house so you may hear people. This property is not suitable for Hen or Stag weekends or young adults hoping to take advantage of the night life Bournemouth has to offer as it is located in a quiet residential area with neighbours in close proximity. Modern clean white bathroom, with a good shower which is easily to get in and out of. Bournemouth has all the usual shops plus more and a massive selection of eateries, bars and clubs all within a gentle stroll along the prom or if legs are tired a trip on the noddy train. Alum Chine beach can be seen from the apartment and is only a 5 minute stroll away. Not so much countryside but The Anchorage overlooks the wonderful Alum Chine which is a beautiful wood lined path that leads down to the Beach. Bournemouth town centre is 20 minute walk away and Westbourne Village is a 15 minute walk away. Offering cafes, restaurants, pubs , boutique shops and an M & S foodhall and mini tescos. Westbourne Village 15 minutes walk away offering Cafe, Pubs, Bars, Restaurants, boutique shops, nail bar, hairdressers, barbers, tesco express and M&S food hall. Large Oak dining table that seats six easily. We do not supply bikes but we can safely store them for you. You can rent them near by. There is a fantastic play park at the end of the road next to the beach which will delight children of all ages. The adults can watch their children from the veranda of Vesuvio restaurant which overlooks the park . I will be honest – our initial impressions were not great – the exterior of the building belies the interior and my heart sank. Thankfully the moment the door opened my worries were put to rest. It really is a lovely apartment with a fabulously comfortable living / kitchen / dining area with beautiful views over the trees at the back. The bedrooms are fine – front facing so you need the blinds down. The bathroom is small but newly decorated and very clean. The location – five minutes walk from Alum Chine beach and Vesuvio restaurant - makes it a very good choice for a holiday apartment. The owners are delightful and quick to help us get the heating on. If I were to be critical the linens, towels and outside furniture could use a refresh. But at the price point exceptional value. Lovely apartment very spacious ,clean and homely arrived to some flowers and lemon drizzle cake such a lovely touch after a long journey, just a 5 minute walk to the beautiful sandy beach plenty of stop off points a long the way into Bournemouth. Would highly recommend this apartment and would definitely return. Great location. Beautiful, clean, tranquil, inviting. Superb hosts. Fabulous lemon drizzle cake greeted us on arrival, lovely surprise. Thank you so much for your amazing review. We are so pleased you enjoyed your stay. We look forward to seeing you again very soon. Wonderful place to stay, would stay again without hesitation. Lovely autumn break in great accommodation. We have just come back from a lovely stay at the Anchorage. The accommodation was fantastic - clean and very comfortable with welcoming touches. Location was excellent. We will definitely be recommending to family and friends. Thank you Helen and Martin. The pictures don’t do it credit! Beautiful apartment! My first impressions on walking in were ‘wow I want to live here’! Such a beautiful, light, airy apartment with a big open plan living area and big squashy sofas. I stayed with my 3 children who also loved it! The walk to the beach is 5 minutes and to the pier is 15 but there’s a little road train you can hop on to speed it up! The beach is quiter than the town centre and there is an adventure play ground for the kids. I would highly recommend this apartment to anyone looking for a relaxing beach side stay. Bournemouth has everything you would need for a great getaway. In the winter the beaches are empty and you can walk or cycle for miles. From Alum Chine you can cycle along the beach during the off season or drive to Sandbanks where you can catch the chain ferry over to the Purbecks. You can mountian bike over the hills, fish off the beach, rent paddle boards, jet skis, kayaks and plenty more. There are public golf courses very close and so many shops if that is your thing. Beach bars and great restaurants within walking distance. If you check the Bournmouth Tourist information website you will find events happening though out the year.